OracleODU is one of the most professional team of Oracle database recovery in China. We have in-depth understanding of Oracle’s internal mechanisms, specialize in conventional and unconventional methods to the case of Oracle recovery. If your database is corrupted, in the absence of backup or valid backup, we may be your last chance. The full name of ODU is Oracle Database Unloader, a tool developed by OracleODU. Similar to DUL (a famous Oracle database recovery utility), ODU can unload data from a complete crashed or corrupted database, even if the database cannot be started anymore or the database itself cannot access the data for whatever reason. We have used it in several real life situations already (customers with a crashed database and no backup), with 100% success rate. In some real cases, DUL can not unload all the important data, but ODU can. Bypass Oracle’s database engine, extracting data directly at the block level. Supports ASM – ODU can unload data directly from ASM disks even all the diskgroups are dismounted. Supports extract files of any type directly from ASM disks even all the diskgroups are dismounted, including datafile, redo log, archive log, etc. In severe ASM disk corruption cases (for example, file directory is totally corrupted), ODU can scan ASM disks, extract all the datafiles which are not overwritten, and then recover all the data. Supports Oracle RDBMS versions 7, 8i, 9i, 10g, 11g and 12c. Supports multiple database platforms, including AIX, LINUX, HPUX, SOLARIS, WINDOWS and so on. Supports cross-platform unloading, for example unloading AIX based datafiles on a Windows host. Supported data types: NUMBER, CHAR, VARCHAR2, NCHAR, NVARHCAR2, LONG, DATE, RAW, LONG RAW, BLOB, CLOB, TIMESTAMP (9i +), BINARY FLOAT, BINARY DOUBLE (10g +). Supports various types of tables, including ordinary HEAP table, IOT table, CLUSTER table. Supports data recovery after truncate table. Supports data recovery after drop table. Automatic acquisition of data dictionary information if SYSTEM tablespace is not totally corrupted. Supports data recovery in the absence of SYSTEM tablespace and data dictionary corruption. 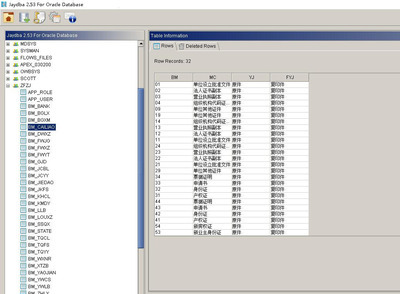 If data dictionary is not available, ODU can automatically determine the data type of a data column. Supports BigFile tablespace in Oracle 10g and above. Fully support for 64-bit systems, supports more than 4G size of the datafiles. Supports bad file copy even the operating system command (for example, cp) can not copy successfully. Supports different block size of datafiles in the same database. Supports conversion between various character sets, can convert CLOB, NCLOB, NVARCHAR2 column type of data to the specified character set correctly. Auto detection of tablespace number, file number and block size of datafiles. Export data formats including both plain text and DMP file. When exporting to plain text, ODU can generate the necessary sql statements for creating table and control file used for SQL*Loader automatically. Simulated dump block function of the Oracle, can dump data blocks from datafiles. Supports DESC command to a table to display the column definition. Supports list all table partitions and subpartions. Supports recover accidentally deleted data, even if the table where the data is deleted has LOB columns, even if all the deleted rows’ offsets in corresponding row directory are completely cleared by Oracle.